Human Rights Activists News Agency (HRANA) – Three Kurdish political prisoners now lay buried in an undisclosed location after being executed in secret on September 8th on murder charges never proven in Tehran criminal court, sparking outrage from their families, attorneys, and the human rights community at large. Without notifying their lawyers or loved ones, prison authorities hanged to death Zanyar Moradi, Loghman Moradi, and Ramin Hossein Panahi, contravening [both Iranian and international law] by seizing and interring their bodies in a location yet unknown to their families, who were put on guard by the Ministry of Intelligence not to speak up about the incident. Hossein Panahi’s brother Amjad confirmed this to HRANA. 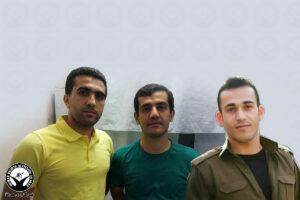 While initial reports by Iranian official sources indicated the executions took place in Rajai Shahr (Gohardasht) Prison in Karaj–the capital of Alborz province about 30 miles west of Tehran, where Hossein Panahi and the Moradis were last known to be held–the Tehran Prosecutor’s Office recently indicated in a statement that they were executed “in Tehran,” accusing the deceased men of violent crimes while withholding further details about their deaths or remains. Hossein Panahi’s lawyer Hossein Ahmadiniaz stated that the execution of the three young men was not only abrupt– it was also unlawful on several counts. According to Ahmadiniaz, the transfer of the prisoners from Sanandaj [300 miles west of Tehran] to Karaj [on the western outskirts of Tehran], preventing Hossein Panahi’s legal team from conferencing with him, was enough in itself to establish authorities’ disregard of the law. Ahmadiniaz’s statements are backed by Saleh Nikbakht, the lawyer representing Zanyar and Loghman Moradi, who has published documents (pictured) demonstrating that the judiciary’s investigation into his client’s murder charges was far from complete. The families of Panahi and the Moradis had been abruptly called in for a visit with their imprisoned loved ones on September 7th, raising the specter of their imminent execution. That night, Nikbakht explains, he went to [Rajai Shahr Prison] where he stood guard from midnight to 6 a.m. alongside Loghman’s father, a number of other Moradi family members, and group of civil activists. An excerpt of Nikbakht’s defense statement, translated into English by HRANA, is below. In my clients’ case file, they were quoted as saying that they disposed of the murder weapon in Marivan lake. This section of the lake in question is 2 to 5 meters deep, a depth at which even a cursory search would have recovered the murder weapon. 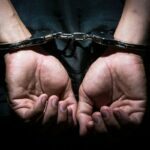 The only evidence against my clients was their confession. The defendants have protested the veracity of this confession. Specifically, after they were transferred from solitary confinement in Sanandaj and Evin prisons to Rajai Shahr’s [general ward], they wrote a detailed letter to the Head of the Judiciary explaining how their confessions had been extracted. There was no evidence to prove they had committed the murder. 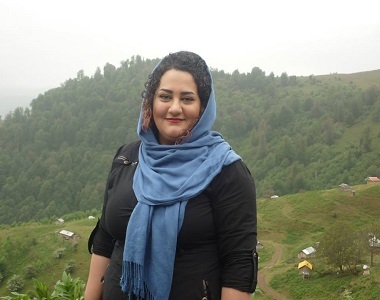 Branch 4 of Tehran Criminal Court (Previously Branch 74) sent the case to Branch 27 of Tehran Criminal Investigation, which, in turn, sent the case to Marivan Court, who were to complete the investigation. Following a few back and forths, I was told that neither new evidence nor the murder weapon had been found, and that they ultimately sent the case back to Tehran without addressing the flaws in the case. There has been no new hearing since the discovery of flaws in the case during the first court session, and the charge of murdering three Salafis was never substantiated. On the day of the murder, Loghman, who was fingered as an accomplice, was working on a crane on a construction site in Sarvabad, 35 km [20 miles] from Marivan. He only returned to Marivan an hour and half after the murder occurred. Philip Luther, Amnesty International’s Research and Advocacy Director for the Middle East and North Africa, released a statement in response to the executions of Zanyar Moradi, Loghman Moradi, and Ramin Hossein Panahi. The full text of his statement is below. “We are horrified by the news that the Iranian authorities have executed these men, despite widespread condemnation of their death sentences, and calls from UN human rights experts and other bodies to halt their executions. 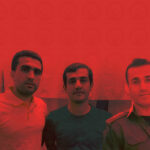 Human Rights Activists News Agency (HRANA) – The legal team of Ramin Hossein-Panahi, a political prisoner on death row, wrote a letter to the head of the Iranian judiciary asking that their client’s execution be stayed, arguing that a retrial would instill a greater sense of national security in Iran. The execution of Hossein-Panahi will lead to “hatred and division,” the lawyers said, while a gesture of mercy could unite the nation. Pursuant to articles 3, 8, 10, 22, 34, 35, 37, 38 and 156, we would like to address your Excellency. The Judiciary is intended to be a haven for the oppressed; this notion of protection is the foundation of all judicial sentences and decisions. Naturally, the ultimate goal of the judicial process should be the same. Islam’s judicial approach obeys the same concept. The principle of justice requires patience– especially in matters where the Islamic government is the wronged party. In the enlightened law of Islam, especially during the time of Ali [the First Shiite Imam], patience was paramount in dealing with those accused of Baqi [literally ‘violation,’ used to denote participation in armed uprising], and not a single soul faced with such charges was ever put to death. Now that we find ourselves in an era of stability for the Islamic Revolution, we anticipate those charged with Baqi today will be met with the same patience that was practiced during Ali’s governance. Our client, a 23-year-old man named Ramin Hossein-Panahi, unwillingly became involved in some questionable matters. He was passing through the country only to meet with his parents — his intentions were limited to the carrying out of family affairs — yet Branch One of the Islamic Revolutionary Court in Sanandaj convicted him of Baqi and sentenced him to death. The case evidence reveals this sentence, by law, to be unfounded. In this wide sea of our Islamic compassion, and by the insightful laws of the Islamic Republic, his sentence must be nullified. It is also the case that the country and the region face threats to their stability; and that inspiring solidarity among all Iranian peoples is an urgent necessity; and that the statements of Ayatollah Khamenei, who urged us to strive for a national unity, all guide your excellency to put a stop to the execution of Ramin Hossein-Panahi and to order a retrial of his case. There is no doubt that the judicious wisdom of your excellency’s choice to stop this execution will go down in history, bring honor to your name, and contribute significantly to fostering security through national harmony, cooperation, and solidarity. Alternatively, the execution of this young man will breed hatred, division, and mistrust, repeating a tired protocol of capital punishment which has failed to see us through our problems and hurdles. Islamic Iran needs compassion and unity. If your Excellency orders to stop this execution and give our client a retrial, those goals will have been served. Maziar Tatayi, Hossein Ahmadiniaz, Osman Mozayan. 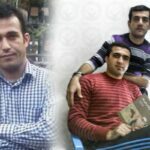 HRANA has published extensively on Hossein-Panahi’s case. 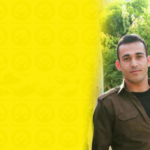 In a video posted online about 10 days ago, Hossein-Panahi refuted the accusations brought against him by the Iranian security apparatus. Human Rights Activist News Agency (HRANA)- After ten days of interrogation at a detention center of the Islamic Revolutionary Guard Corps (IRGC), Kamal Hassan Ramezan, 33, who is from the Syrian Kurdish town of Serikani, was transferred back to Ward 12 of Urmia Central Prison on Thursday, August 23, 2018, where he awaits execution. 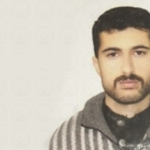 First arrested near Urmia in July 2014 by IRGC forces, Ramezan underwent interrogation for four months on the charge of Moharebeh (“enmity against God”). Urmia court authorities then officially charged Ramezan, who is of Kurdish descent, with Moharebeh for his alleged affiliation with a Kurdish opposition group, and transferred him to Urmia Central Prison. While awaiting trial for the above charges, he was coerced and tortured into providing a televised confession. On August 14, 2015, Branch 2 of the Urmia Revolutionary Court, presided by Judge Sheikhlou, sentenced Ramezan to ten years and one day in prison. In 2016 Ramezan was targeted again, interrogated as a suspect in the 2006 murder of an IRGC member in Urmia. Despite an alibi of not having been in the country at the time of the murder, he was tried and sentenced to death in absentia by Branch 3 of the Urmia Revolutionary Court on May 20th, 2017, and has remained in prison since.